On that trip (July 16-August 19), Meher Baba visited: London; New York City; the Meher Spiritual Center in Myrtle Beach, SC; Washington, DC; Los Angeles; Ojai, CA; San Francisco; and Sydney and Melbourne in Australia. The three-day stop in Southern California included His first and only visit to Meher Mount on August 2, 1956. By clicking on this 1956 link, you can see more than 500 photos related to events, fashions, politics, advertising, sports, cars and trends in 1956. The following are selected photos of a few 1956 events. CELEBRATION of the 2500th Anniversary of the birth of Lord Buddha in New Delhi, India, in 1956. Included in the photograph are: India’s first Prime Minister after its independence Jawaharlal Nehru (1889-1964); His Holiness the 14th Dalai Lama of Tibet (1935- ); India’s first President after independence Rajendra Prasad (1884-1963); and the 10th Panchen Lama (1938-1989). Two of Meher Baba’s favorite writers were Agatha Christie, writing the Hercule Poirot mystery series, and Rex Stout, author of the Nero Wolfe stories. The books published in 1956 by these authors were: Dead Man’s Folly by Agatha Christie; and Three Witnesses and Might As Well Be Dead, both by Rex Stout. There is a list of books that were read to Meher Baba by His close women disciples (mandali) in the biography, Mehera-Meher: A Divine Romance by David Fenster. Most of the books on this list were favorites of Meher Baba’s and were kept and read to Him more than once. The books were read at Meherazad, Meher Baba’s last home in India, unless otherwise noted. Rosa Parks was a black seamstress who refused to give up her bus seat to a white man on a Montgomery, AL, city bus on December 1, 1955. Her arrest and conviction of violating segregation laws sparked what became the 13-month Montgomery bus boycott. The struggle continued to the courts in the Aurelia S. Browder v. William A. Gayle lawsuit which challenged the Alabama state statutes and the Montgomery city ordinances requiring segregation on Montgomery buses. A three-person panel at the U.S. District Court on June 5, 1956, ruled two-to-one that segregation on Alabama’s intrastate buses was unconstitutional. During Meher Baba's visit to the US in 1956, He had a conversation with Darwin Shaw about the racial situation in America. The television people eventually arrived and finished filming sometime after 6:00 p.m. They spent the night in Myrtle Beach, and the next morning on Saturday, July 28, 1956, they filmed Meher Baba at a spot overlooking the lake. "The source of Eternal Bliss is the Self in all. The cause of perpetual misery is the selfishness of all. As long as satisfaction is derived through selfish pursuits, misery will always exist. In 1957, The Ten Commandments was shown at the Regal Cinema in Bombay (Mumbai). On January 28, 1957, Arnavaz Dadachanji took a group of Meher Baba’s women followers to see the film. Meher Baba had seen the movie four days earlier with the men mandali. He had left halfway at intermission, but praised the film and said He liked it. At 11:10 p.m. on July 25, 1956, just 45 miles south of Nantucket Island on the East Coast of the U.S., the Italian ocean liner Andrea Doria and the Swedish ocean liner Stockholm collided in a heavy Atlantic Ocean fog. The result was a great hole in the broad side of the Andrea Doria. Five crewmen of the Stockholm were killed in the collision, and 46 passengers and crew from the Andrea Doria were killed. On the same day, as the sinking of the Andrea Doria, July 26, 1956, the new ruler of Egypt, Colonel Gamal Abdel Nasser seized and nationalized the Suez Canal. The canal had been owned by the Suez Canal Company, which was controlled by French and British interests. “Presently, he rose and faced west. He was working — his fingers pulsed with the rapid, characteristic gestures. His head was bowed, and his face was drawn and full of suffering. He did, indeed, look as if the suffering of the world were upon him. Baba walked along the pathway to the Barn, beckoning his lovers to follow. After a few hundred feet, he motioned them to stop and asked them to concentrate for one minute while looking into his eyes. The 1956 Republican National Convention that nominated Eisenhower was held at the Cow Palace in San Francisco between August 20-23, 1956. Meher Baba arrived in San Francisco on August 3, 1956. Because of this upcoming convention most hotel rooms had long been booked. When Meher Baba was planning His 1956 trip to the West, He did not want it to coincide with a state visit planned by Indian Prime Minister Jawaharlal Nehru to the U.S. to meet with President Eisenhower (July 6-10). Thus, instead of leaving India during the first week of July as originally planned, Meher Baba decided to leave on July 16. 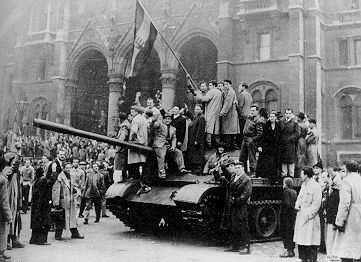 In October 1956, a rising tide of unrest and discontent in Hungary broke out into active fighting with the Hungarians demanding a more democratic political system and freedom from Soviet oppression. Rebels won the first phase of the revolution, and Imre Nagy became premier, agreeing to establish a multiparty system. On November 1, 1956, he declared Hungarian neutrality and appealed to the United Nations for support, but Western powers were reluctant to risk a global confrontation. The unanticipated low number of participants in the 16th Olympiad has been attributed to the remoteness of Australia and two international crises. On His 30-day trip in 1956, Avatar Meher Baba visited Melbourne and Sydney in Australia in August. From Australia, Meher Baba and the four men mandali accompanying him – Eruch Jessawala, Dr. Nilu (Vinayak Nilkanth Godse), Adi K. Irani, and Meherjee Karkaria – flew to India, landing in Bombay at 1:00 p.m. on Friday, August 17. Bhau Kalchuri, Lord Meher: The Biography of the Avatar of the Age Meher Baba, Online Edition, pg. 4114, accessed June 25, 2016. (c)Avatar Meher Baba Perpetual Public Charitable Trust. Used by permission. Pinterest is a social media network that allows users to share images or videos on their boards with each board having a common theme. Meher Mount’s Pinterest page has 10 themed Boards related to Meher Baba and Meher Mount. Kalchuri, op.cit., pg. 3964, accessed June 25, 2016. David Fenster, Mehera-Meher: A Divine Romance (Ahmednagar, India: Meher Nazar Publications, 2016 PDF Edition), Volume III, pp. 589-593. (c)David Fenster. Used by permission. Finding Dulicnea, “On This Day: Supreme Court Outlaws Bus Segregation,” accessed July 10, 2016. History.com, “Rosa Parks,” accessed July 10, 2016. Stanford University, The Martin Luther King, Jr. Research and Education Institute, King Encyclopedia, “Browder v. Gayle, 352 U.S. 903 (1956)," accessed June 26, 2016. King Encyclopedia, “The Montgomery Bus Boycott (1955-1956)," accessed June 26, 2016. Darwin C. Shaw, As Only God Can Love: A Lifetime of Companionship with Meher Baba (North Myrtle Beach, SC: Sheriar Foundation), pg. 349. (c)Darwin C. Shaw. Used by permission. Kalchuri, op.cit., pg. 4015, accessed June 24, 2016. Famous Logos, “NBC Logo,” accessed June 25, 2016. Kalchuri, op.cit., pg. 4001, accessed June 24, 2016. Kalchuri, ibid., pg. 4038, accessed June 24, 2016. Bernard J.O. Carvalho was a director of publications and former reporter who was helping Ivy Duce publicize God Speaks. Kalchuri, ibid., pg. 4034, accessed June 24, 2016. Kalchuri, op.cit., pg. 4041, accessed June 25, 2016. History.com, “Ships collide off Nantucket,” accessed June 23, 2016. The Telegraph, “Suez Canal: from crisis to crisis,” accessed June 25, 2016. Encyclopedia Britannica, “Suez Crisis, Middle East (1956)," accessed June 25, 2016. Encyclopedia Britannica, “Suez Canal,” accessed June 25, 2016. Kalchuri, op.cit., pg. 4021, accessed June 25, 2016. Kalchuri, ibid., pg. 4021, accessed June 26, 2016. Kalchuri, ibid., pp. 4070-4071, accessed June 26, 2016. Kalchuri, ibid., pg. 3970, accessed June 26, 2016. Flickr, "Archives: President Eisenhower visits India," U.S. Embassy New Dehli, accessed July 12, 2106. History.com, “Soviets put brutal end to Hungarian revolution,” accessed June 26, 2016. Encyclopedia Britannica, “Hungary v. U.S.S.R.: Blood in the Water, Melbourne 1956 Olympic Games,” accessed June 26, 2016. Encyclopedia Britannica, “Melbourne 1956 Olympic Games,” accessed June 30, 2016.